Up to 11 military aircraft, one civil aircraft and 14 ships will assist in today’s search for missing Malaysia Airlines flight MH370. Today the Australian Maritime Safety Authority has planned a visual search area totalling approximately 57,506 square kilometres. The centre of the search areas lies approximately 2200 kilometres north west of Perth. Today, Australian Defence Vessel Ocean Shield continues more focused sweeps with the Towed Pinger Locator to try and locate further signals related to the aircraft's black boxes. The AP-3C Orions continue their acoustic search, working in conjunction with Ocean Shield. The oceanographic ship HMS Echo is also working in the area with Ocean Shield. This work continues in an effort to narrow the underwater search area for when the Autonomous Underwater Vehicle is deployed. There have been no confirmed acoustic detections over the past 24 hours. The weather forecast for today is south easterly winds with isolated showers, sea swells up to one metre and visibility of five kilometres in showers. A second day has passed without the massive international air and sea search for missing Malaysia Airlines Flight 370 in the southern Indian Ocean detecting signals from what are thought to be the aircraft's black box recorders. “There have been no confirmed acoustic detections over the past 24 hours,” the Joint Agency Coordination Centre said in a statement, repeating its message from Saturday. The authority has been working to refine the size of the underwater search area to allow the use of an autonomous underwater vehicle, which will more closely scour the sea floor to get visual images of any possible wreckage. The visual search area was extended Sunday to 57,506 square kilometers (22,203 square miles) without explanation. A spokesperson for the authority wasn’t immediately available for comment. The search zone had been narrowed in previous days to as small as 41,393 square kilometers Saturday. KUALA LUMPUR, Malaysia—Authorities are consulting with international legal experts to consider which country should get custody of the black boxes from Flight 370 if they are located and retrieved from the Indian Ocean, Defense Minister Hishammuddin Hussein said Sunday. Precedent in past airline crashes would give the country overseeing the search—in this case, Malaysia—authority to determine how the black boxes are recovered and analyzed. Kuala Lumpur has so far delegated large parts of the search and investigation to countries and agencies with better technical resources, and it is expected to designate foreign experts to download data from the devices. Mr. Hishammuddin, who also is acting transport minister, told reporters that Attorney General Abdul Ghani Patail was in London discussing "who actually has custody over the black box" with the United Nations' International Civil Aviation Organization and other legal experts. Mr. Hishammuddin suggested that further discussion on the topic was premature. "I would like to address that when we actually do find the black box," he said. The pilot and co-pilot have been a chief focus of the investigation, in part because they are the only people on board known to have had the skill to fly a Boeing BA -1.27% 777, according to people close to the investigation. Mr. Hishammuddin said he had no knowledge of such a call and didn't want to speculate on the report out of respect for the families of the pilot and co-pilot. "That would be in the realm of the police and the other international agencies, and when the time comes that will be revealed," Mr. Hishammuddin said. "I do not want to disrupt the investigations that are being done now, not only by the Malaysian police but the FBI and MI6 and the Chinese intelligence and other international intelligence agencies." Contradicting Malaysia's top police official, Mr. Hishammuddin said that investigators haven't ruled out the possible involvement of passengers in the plane's disappearance. Up to 11 military aircraft, one civil aircraft and 15 ships will assist in today's search for missing Malaysia Airlines flight MH370. Today the Australian Maritime Safety Authority has planned a visual search area totalling approximately 47,644 square kilometres. The centre of the search areas lies approximately 2,200 kilometres north west of Perth. Today, Australian Defence Vessel Ocean Shield continues more focused sweeps with the Towed Pinger Locator to try and locate further signals related to aircraft black boxes. The AP-3C Orions continue their acoustic search, working in conjunction with Ocean Shield. The oceanographic ship HMS Echo is also working in the area with Ocean Shield. The weather forecast for today is south easterly winds with possible showers, sea swells up to 1.5 metres and visibility of three to five kilometres. Today it was also revealed that a remote island in the middle of the Indian Ocean with a runway long enough to land a Boeing 777 was programmed into the home flight simulator of the pilot of the missing Malaysia Airlines plane. Police are now urgently investigating whether Captain Zaharie Ahmad Shah had practised landing at Diego Garcia, an island south of the Maldives occupied by the US navy. Police seized the simulator from his home outside Kuala Lumpur over the weekend and reassembled it at police headquarters, hoping for information on the flight's fate. The investigation into the Diego Garcia, an overseas territory of the UK, which is rented to the US and is now a huge American naval base follows fresh eyewitness accounts of a 'low flying jumbo jet' being spotted in the Maldives. People on the island of Kuda Huvadhoo reported seeing a plane on the morning of the disappearance of Malaysian Airlines flight MH370, according to a Haveeru, a news website in the Maldives. Islanders said a white aircraft with red stripes across it - which would match the missing plane - was seen travelling North to South-East towards Addu, the southern tip of the Maldives. An eyewitness told the website: 'I've never seen a jet flying so low over our island before. We've seen seaplanes, but I'm sure that this was not one of those. I could even make out the doors on the plane clearly. Captain Shah, a father-of-three, was passionate about his simulator, which he built using off-the-shelf parts. Diego Garcia, a remote island in the middle of the Indian Ocean with a runway long enough to land a Boeing 777 was programmed into the home flight simulator of the pilot of the missing Malaysia Airlines plane, it has been revealed. When I consider the sightings of a low flying plane by residents of Kuda Huvadhoo and fishermen of Kota Bharu ... the sightings on the morning of March 8th of a low flying plane that fits the description of MH370 and ... when I consider there is no evidence of a crash in that ocean in the path taken by the plane ... I am cling to hope that the plane landed on an isolated landing strip on the remote island of Diego Garcia. A spokesman for the US embassy in Kuala Lumpur, Malaysia, insisted: "MH370 did not land in Diego Garcia." The United States has flatly denied claims that missing Flight MH370 had landed at its military base on the remote island of Diego Garcia. There have been rumours that the jetliner could have headed for the small coral atoll in the Indian Ocean after it veered off course while travelling between Kuala Lumpur, Malaysia and Beijing, China on March 8. However, a spokesman for the US embassy in the Malaysian capital said there was no truth in this speculation. He told Malaysia's Star newspaper by email: "There was no indication that MH370 flew anywhere near the Maldives or Diego Garcia. "MH370 did not land in Diego Garcia. RT @TroyWSJ: Breaking: #MH370 search to cease scans for black box signals and send submersible to sea floor. (CNN) -- With no underwater pulses detected in almost a week, Australian authorities said Monday they will stop listening for pings coming from the floor of the Indian Ocean -- and will now deploy an underwater vehicle. "We haven't had a single detection in six days. It's time to go underwater," Australian chief search coordinator Angus Houston said. The Bluefin-21, a probe equipped with side-scan sonar, will be deployed as soon as Monday evening Perth time. Side-scan sonar is an acoustic technology that creates pictures from the reflections of sound rather than light. Though the discovery of four pings believed to be from the jet's so-called black boxes -- its flight data recorder and its cockpit voice recorder -- have helped investigators narrow the search area, they would still face a formidable task. Houston cautioned against hopes that the underwater vehicle will find wreckage. "It may not," he said. "This will be a slow and painstaking process." Each deployment will last 24 hours. It will take two hours for the Bluefin-21 to get down to the bottom of the ocean, it will scour the ocean bed for 16 hours, and take another two hours to resurface. It will take take another four hours to download and analyze the data collected, Houston said. The first mission will cover an area 5 kilometers by 8 kilometers ((3.1 miles by 4.9 miles). The bottom of the search area is not sharply mountainous -- it's more flat and almost rolling, Houston said. But he said the area likely has a lot of silt on the bottom, which can "complicate" the search. Meanwhile, the Australian ship Ocean Shield detected an oil slick Sunday evening, but it is unclear where the oil came from. Two liters have been collected for examination, Houston said. But it will take a few days. "I stress the source of the oil has yet to be determined but the oil slick is approximately 5,500 meters downwind...from the vicinity of the detections of the TPL on Ocean Shield," Houston said, referring to the pings detected by the towed pinger locater. The developments come after a weekend of notable developments in the search for MH370, which disappeared March 8 with 239 people on board. Monday marks Day 38 of the search. A transcript of the Q and A session is also included. Angus Houston: I'll start by introducing those behind me. Commodore Peter Leavy, who's the Task Force Commander of all the Australian Defence assets that are out there involved in the search for MH370. On my right we have Mr Scott Constable from AMSA, the Australian Maritime Safety Authority, and over here, Bob Armstrong from ATSB, the Australian Transport Safety Bureau. 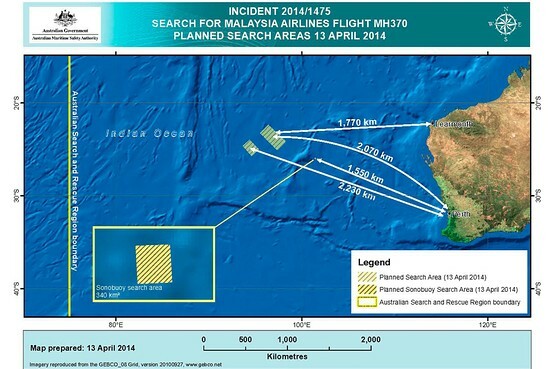 I would like to update you on the latest developments regarding the search for missing flight MH370. As you are aware, there have been no confirmed signal detections since last Tuesday night Perth time. Today is day 38 of the search. The guaranteed shelf-life of the batteries on the aircraft black boxes is 30 days. Despite the lack of further detections, the four signals previously acquired taken together constitute the most promising lead we have in the search for MH370. We need to pursue this lead as far as possible. Analysis of the four signals has allowed the provisional definition of a reduced and manageable search area on the ocean floor. The experts have, therefore, determined that the Australian Defence Vessel Ocean Shield will cease searching with the Towed Pinger Locator later today and deploy the Autonomous Underwater Vehicle, Bluefin-21, as soon as possible. The Bluefin-21 is equipped with side scan sonar. Once deployed, it will begin searching the sea floor in the vicinity of the detected signals. Each mission conducted by the Bluefin-21 will take a minimum of 24 hours to complete. It will take the Autonomous Underwater Vehicle two hours to get down to the bottom of the ocean. It will then be on task for 16 hours. It will then take two hours to return to the surface and four hours to download and analyse the data collected. The first mission will see Bluefin-21 cover an area of approximately five kilometres by eight kilometres, an area of 40 square kilometres. The Autonomous Underwater Vehicle in sight scan sonar mode transmits an active pulse which produces a high resolution, three dimensional map of the sea floor. The deployment of the Autonomous Underwater Vehicle has the potential to take us a further step towards visual identification since it offers a possible opportunity to detect debris from the aircraft on the ocean floor. As I have said before, aircraft wreckage needs to be visually identified before we can say with certainty that this is the final resting place of MH370. I would caution you against raising hopes that the deployment of the Autonomous Underwater Vehicle will result in the detection of the aircraft wreckage. It may not. However, this is the best lead we have and it must be pursued vigorously. Again, I emphasise that this will be a slow and painstaking process. In another development, I can report Ocean Shield detected an oil slick yesterday evening in her current search area. A sample of about two litres has been collected and it will be a number of days before it can be landed ashore and conclusively tested. I stress the source of the oil is yet to be determined but the oil slick is approximately 5,500 metres down-wind and down-sea from the vicinity of the detections picked up by the Towed Pinger Locator on Ocean Shield. A few words about today's search. Up to 11 military aircraft, one civil aircraft and 15 ships will assist in today's search. HMS Echo is working in the area supporting Ocean Shield, providing oceanographic support and analysis. The planned visual search area is about 47,644 square kilometres. The centre of the search area lies approximately 2,200 kilometres north-west of Perth. The air and surface search for floating material will be completed in the next two to three days in the area where the aircraft most likely entered the water. The chances of any floating material being recovered have greatly diminished and it will be appropriate to consult with Australia's partners to decide the way ahead later this week. The weather forecast for today is south-easterly winds with possible showers, sea swells of up to 1.5 metres and visibility of three to five kilometres. I'm now happy to take your questions. I have been accused of suspecting a conspiracy when there is none but ... considering there is no hard evidence I remain sceptical that MH370 crashed into the Indian Ocean. The major network are very quiet about the island of Diego Garcia with a runway where an aircraft the size of MH370 could have landed. Why? The major networks are very quiet quiet about the Kuda Huvadhoo witnesses who reported a low flying aircraft that flew overhead on the morning of March 8, 2014. Why? KUALA LUMPUR: The US embassy here says there is no truth in speculation that missing Flight MH370 could have landed in its military base at Diego Garcia, located in the middle of the Indian Ocean. An embassy spokesman also said there was no indication that the plane flew anywhere near the Maldives. “There was no indication that MH370 flew anywhere near the Maldives or Diego Garcia. MH370 did not land in Diego Garcia. “Under the coordinating efforts of Malaysia and Australia, the US Navy’s Seventh Fleet is working alongside 26 other nations to locate the aircraft based on areas identified by Malaysian and international experts,” he said in an e-mail reply to The Star yesterday. MH370 disappeared on March 8 with 239 passengers and crew members on board the flight bound for Beijing. There has been talk that the plane had landed in Diego Garcia, which is about 3,500km from Malaysia and which the United States uses as a military base. MH370 Held in Diego Garcia? Conspiracy Theory and GPS Data Suggests Missing Malaysian Airplane Could be Found in Remote Island in the Indian Ocean? According to a call from my 16 year old grandson ... the Diego Garcia theory was discussed by a panel on NBC (?) about an hour ago. 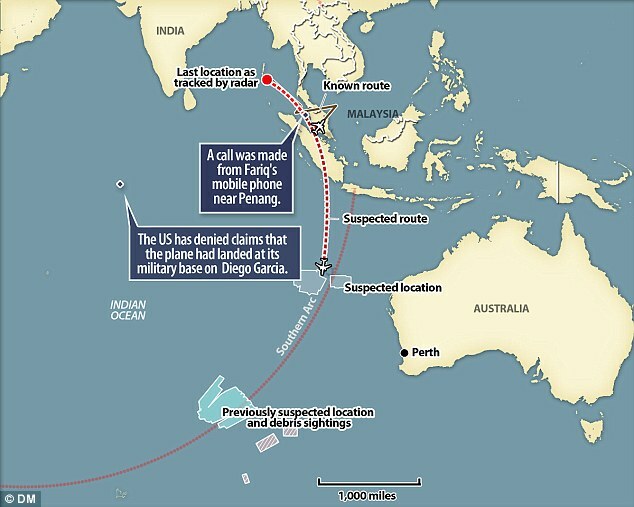 Apparently ... some on the panel find it highly suspicion that Diego Garcia has not been an obvious focus of speculation by the "powers that be" in the search for MH370 following the British revealing that sharp right turn back over Malaysia to the Indian Ocean? If Diego Garcia had been preciously investigated and ruled out ... why was it not announced to the world way back then rather than waiting until it was obvious the theories that abound were not going to go away? Could it be the search outside of Perth and the pings be all a distraction from a behind the scenes investigation? If the Diego Garcia theory turns out to be just that ... a theory ... my temporary connection with 16 year old grandson made it all worth while. This young man is growing so fast. Friends and activities tend to take priority. 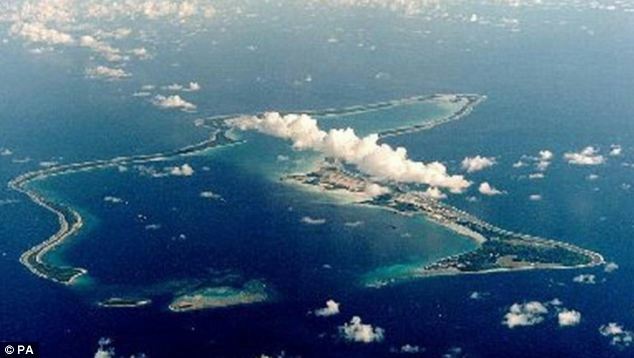 It involved a small atoll in the Indian Ocean that is a military island, controlled and operated by the US and the UK. According to the report, the conspiracy theory now gaining traction on the internet comes from freelance journalist Jim Stone and concerns the atoll of Diego Garcia. According to Stone’s theory, an American passenger on board MH370, named as Philip Wood, sent out an image and voice activated text, along with GPS coordinates that trace to a location a few kilometres away from Diego Garcia. The text claimed that Wood was being held hostage by unknown military personnel. This report has now sparked speculation that MH370 had landed on this US military base. 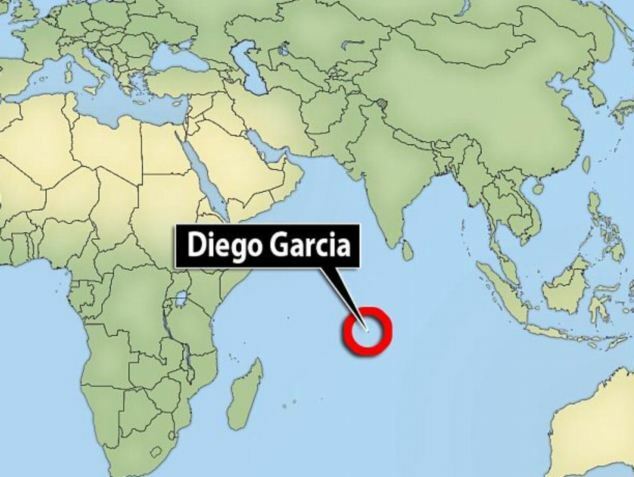 Even more interestingly, Diego Garcia is reported to also act as an emergency landing site for commercial aircraft that are cleared to fly the long, landless distance over the Indian Ocean. Diego Garcia is a tiny atoll in the middle of the Indian Ocean. The AsiaOne report quotes the official British government site, gov.uk, as stating that the British Indian Ocean Territory is administered from London and there is no British diplomatic or consular representation on Diego Garcia and that it is not a tourist destination. Access is restricted and a permit is required in advance of travel. In Jake Trapper's opinion ... the Diego Garcia Island theory need to be debunked. Why? According to the families of those aboard ... a search is being demanded. Why has a search/investigation not already been conducted? Why was the WH spokesperson prepared with a only short response regarding Diego Garcia Island when questioned during a press conference? The silence from the "powers that be" as well as the press regarding the possibility that MH370 landed on this Island appears to be motivating more suspicion. (CNN) – Ever since Malaysia Airlines Flight 370 disappeared, there have been countless outrageous conspiracy theories about what may have happened to the plane, ranging from alien abductions, to Bermuda Triangles over the Indian Ocean. Many have been so absurd, we didn't find it necessary to debunk them. But there's one theory that seems to be picking up steam as of late, a theory that needs a debunking. It involves Diego Garcia – a tiny, remote island that many have probably never even heard of. UNIDENTIFIED MALE: Some news report saying that the missing flight could have landed in the U.S. military base, Diego Garcia in central of Indian Ocean, do you rule in that or rule out that? JAY CARNEY, WHITE HOUSE PRESS SECRETARY: I'll rule that one out. Jake Tapper, doing a segment on The Lead, stated that after the Philip Woods picture went on the internet, the families of the flight 370 passengers asked for authorities to search Diego Garcia. Now, this is news to me, as I haven’t heard CNN report before that the families have demanded an investigation into Diego Garcia. Hmmm, you’re right Jake. MH370 Diego Garcia theory just keeps gaining strength. According to these articles, the theory that the plane landed there is not true. Your grandson is 16 already? How fast they grow up! Nice that you had some quality time with him. Up to nine military aircraft, two civil aircraft and 11 ships will assist in today's search for missing Malaysia Airlines flight MH370. Today the Australian Maritime Safety Authority has planned a visual search area totalling approximately 62,063 square kilometres. The centre of the search areas lies approximately 2,170 kilometres north west of Perth. The Autonomous Underwater Vehicle deployed last night from ADV Ocean Shield. After completing around six hours of its mission, Bluefin-21 exceeded its operating depth limit of 4,500 metres and its built in safety feature returned it to the surface. The six hours of data gathered by the Autonomous Underwater Vehicle is currently being extracted and analysed. Bluefin-21 is planned to redeploy later today when weather conditions permit. The weather forecast for today is south easterly winds with scattered showers and isolated thunderstorms, sea swells up to two metres and visibility of five kilometres. The Chief Coordinator of the Joint Agency Coordination Centre, Air Chief Marshal Angus Houston (Ret'd), will provide further updates if, and when, more information becomes available. PERTH, Australia - The search area for the missing Malaysian jet has proved too deep for a robotic submarine which was hauled back to the surface of the Indian Ocean less than half way through its first seabed hunt for wreckage and the all-important black boxes, authorities said on Tuesday. Search crews sent the Bluefin 21 deep into the Indian Ocean on Monday to begin scouring the seabed for the missing Malaysia Airlines Boeing 777 after failing for six days to detect any signals believed to be from its black boxes. But after only six hours of its planned 16-hour mission on the sea bed, the autonomous underwater vehicle exceeded its maximum depth limit of 15,000 feet and its built-in safety feature returned it to the surface, the search coordination center said in a statement on Tuesday. What if anything it might have discovered during the six-hour search was still being analyzed, the center said. The Bluefin 21 will resume the search Tuesday when weather conditions permit, it said. Search authorities knew that the primary wreckage from Flight MH370 was likely lying at the limit of the Bluefin's dive capabilities. Deeper diving submersibles have been evaluated, but none is yet available in the search area.